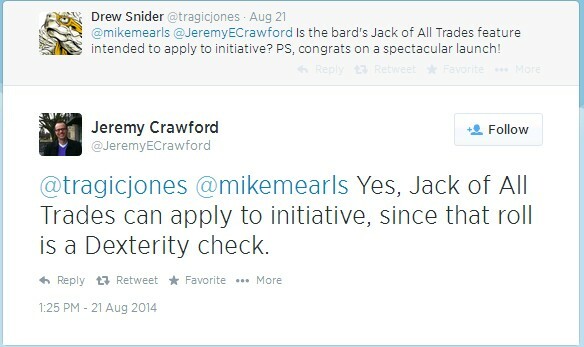 Does Bard's Jack of All Trades grant them greater initiative? Starting at 2nd level, you can add half your proficiency bonus, rounded down, to any ability check you make that doesn't already include your proficiency bonus. Since your initiative roll is based purely on your dexterity, and it says "ability check" and not "skill check", does that mean that a Bard, starting at 2nd level, will tend to have better initiative than others? Yes, the bard gets 1/2 proficiency to initiative. In 5e all checks are ability checks. This is why every check in published materials is listed as Ability (Name), such as Strength (Athletics). If you can add an ability modifier to a roll, it's an ability check (unless it's a saving throw or an attack, those aren't ability checks). If you happen to have a skill related to that ability, and you are proficient in that skill, you can add your proficiency bonus. Intiative is a Dex check with no potential skill attached to it. So things that modify Dex checks work. Other things modify your ability checks as well (such as adding all or half of your proficiency bonus. The bard has one example of this. Since Initiative is an ability check that uses your Dex, the Champion Fighter also gets half their proficiency to initiative. The initative roll is a dexterity ability check, and is intend to gain a benefit from "Jack of all Trades"
At the beginning of every combat, you roll initiative by making a Dexterity check. Not the answer you're looking for? Browse other questions tagged dnd-5e bard or ask your own question. Can you have advantage/disadvantage on your Initiative check? Does Jack of All Trades count for having proficiency in Performance for practicing a profession? Does Passive Initiative exist (can it be used instead of rolling for Initiative)? How can a spell caster increase the probability that they can cast a spell from a scroll that is a higher level than they can cast? How does Jack of All Trades interact with Reliable Talent? What specifically does the bard's Jack of All Trades feature apply to? Does Jack Of All Trades allow me to keep the bonus after I become proficient in the skill later? Does Bard's Jack of all Trades increase passive checks? Does the bard's Jack of All Trades feature make them proficient with thieves’ tools? Does Jack of all trades affect AC? If a bard uses a musical instrument as their spellcasting focus, can they add their proficiency bonus to an ability check made as part of a spell? Are there other features like “Jack of All Trades” or “Remarkable Athlete”? Is there a way to add your proficiency bonus to a generic ability check for use with Reliable Talent?